The Crewe Christmas lights switch-on took place on Thursday 28th November 2013 on the Town Square. There was entertainment in the evening from jazz musician Tom Seals and Katy Perry tribute K T Perry. Father Christmas also took time out of his busy schedule to make an appearance. The Mayor of Crewe Councillor Irene Faseyi, assisted by K T Perry, turned on the Christmas lights which were followed by a firework display by local company Blitz Fireworks (http://www.blitzfireworks.com), with rockets launched from the roof of the Crewe Town Clock. K T Perry sang ‘Firework’ during the display. There were also children's fairground rides, a candy floss stall and a large outdoor market. Hundreds of local adults and children attended the event. The switch-on also marked the start of late-night shopping in Crewe over the festive period. - Saturday 14th December – 3pm start - Christmas Carol Extravaganza - St Stephen’s Methodist Church, Gainsborough Road, Crewe CW2 7JX. Tickets = £6 including a buffet at the interval. Proceeds to St Stephen’s Methodist Church and Wistaston Singers. Come along and join us in singing your favourite Christmas carols. The Wistaston Singers were originally formed by members of the choir at St Mary's Parish Church Wistaston in May 2000 and now numbers over forty members singing four-part harmony music. The choir perform a variety and eclectic choice of music ranging from choral church music and anthems, Gilbert and Sullivan items, music from the shows, music from modern composers such as John Rutter covering from the 17th century to the 21st century. The choir members are amateur singers who rehearse and perform for their enjoyment of music and singing. Cheshire East Council leader Councillor Michael Jones has welcomed a new law to cap the cost of payday loans. This week, the Government announced it is to introduce the law following practical steps taken by Cheshire East Council to ban access to the top 50 payday lending websites on its public computers, one of the first councils in England to do so. Councillor Jones said: “It is good to see the Government is following our lead and will now introduce strict laws. “We want to protect the most vulnerable of people from falling into the trap of borrowing money at astronomical rates of interest. One payday loan firm was found by councillors to be charging interest of more than 5,850 per cent. Just last month, the entire Cheshire East Council Cabinet and many councillors signed up ‘en masse’ to become members of the local Cheshire Neighbours Credit Union (CNCU) in its fight to take on ‘rip-off’ payday loan firms. The Financial Conduct Authority (FCA), which takes over regulation of the sector in April, already has the power to cap the cost of payday loans and has proposed several new rules intended to protect consumers. But in an amendment to the banking reform bill going through parliament, Chancellor George Osborne has ‘put a duty on the FCA’ to use its powers to impose a cap and called it a ‘logical step’. Many of Cheshire East’s unsung heroes have been honoured at the Council’s annual sports awards. Now in its fourth year, the event aims to recognise the time and dedication put in by volunteers, coaches, clubs and athletes to develop sport across Cheshire East. More than 170 people attended the awards hosted by BBC Radio Manchester’s Mike Shaft. This year a record 91 nominations were received in the 10 categories. The event, held at Cranage Hall, is organised by the Council’s leisure development department. Councillor Janet Clowes, Cabinet member in charge health and adult social care, said: “This awards ceremony recognises those at the grass-roots level who have a passion for sport and represent Cheshire East. Councillor Clowes’ Cabinet support member for health, Councillor Gail Wait, attended the event. Directors of Cheshire East Council’s impending new trust, Everybody Sport and Recreation, also attended. Sports clubs and organisations also had the opportunity to find about the new body as part of a display about the way leisure services will be delivered locally. With more than a 90 per cent reduction in public pothole reports, Cheshire East Council is making great strides in its efforts to improve the roads. The number of potholes reported to the Council was more than 3,600 during January this year, following the second wettest year on record in the UK. Now, this has cut dramatically to less than 300 – a massive tenfold reduction. Cheshire East’s highways team is working hard to radically improve the Borough’s highway network and is delighted with the 56,000-plus potholes repaired since January. The initial 50,000 target for the year was achieved during the summer. And, with winter now in full swing, taxpayers have a much-improved highway network. Councillor Michael Jones, Leader of Cheshire East Council, said: “We could not hide from the fact our roads were in a bad state of repair 12 months ago so it is encouraging to know that pothole reports are down so dramatically and our highway network looks so much better. “I made pothole repairs a major priority when I became leader and I am delighted to say we are now on course to reach the 100,000 mark, under my leadership, in the near future. “However, that does not mean our work is done and we will continue to monitor the roads and prioritise works accordingly. Councillor David Topping, Cabinet member in charge of the environment, added: “The majority of potholes and ‘defects’ are now self-identified through our team of highways inspectors. And even these have reduced by 43 per cent. “Since January 2013, the Highways Investment Programme (HIP) has delivered approximately 175 km of repaired road, including resurfacing, surface dressing, micro-asphalt and permanent patching. “Significantly, members of the public, elected members of the Council and our frontline highways inspectors have all commented on the huge improvement to the network. Meanwhile, the Council has been busy emptying more than 41,000 of its 90,000 gullies in the last seven months. Having taken advantage of the longer days, this represents around 80 per cent of the annual target of 53,000, releasing valuable resource to provide vital winter services over the coming months. This year, a dedicated gully care team was established with two new cleaning and jetting units and a state-of-the-art waste recycling facility based at Brunswick Wharf depot, in Congleton. This depot houses a waste recycling facility, known as ‘Moos’, which recovers water from the waste and recycles this for use in the gully cleansing process. The remaining solids are sent for waste disposal but this only amounts to a small proportion of the waste collected. We would have expected the public to have their say on the matter of fishing as it effects their safety and the lives of the wildlife as swans have been hooked up last year. People I have spoke to and I am in the park every day dont believe it will be safe for people to walk near the lake if fishing is going on. If you fish with a 12 ft rod from the fisherman you need 12 ft clear all around you plus the line in many cases this isn't possible as its to close to paths and therefore people are in danger of being hooked up. See the statements below the first statement was from Cllr Jones and also printed in the Chronicle the email below proves someone is lying and also that the friends have no effect on the decisions local officers make and as such it’s a waste of everyone’s time if the officers then do what the hell they want without any one from the public getting their opinion considered and the fishing has now been rushed through before anyone can object. 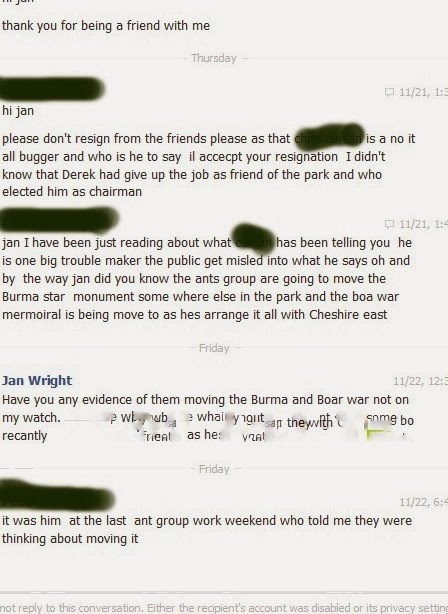 We cant believe Cllr Jones has made the statement knowing it to be false so what going on? Some facts. There has been illegal fishing in the park with kids and other fishing with no licence and no permission they claim they couldn’t stop it. It clear the Friends Group and ANTS weren’t consulted as was stated. Its stated the Friends have now power and as such what is there role if no one listens to them or public opinion? As the Club is run by an individual who is collecting the money and were is it going if it’s the club then it’s a company has the man registered the fact and if he is on any sort of benefits like housing benefit advised them of his income and paying tax? As he has bailiffs acting for him as volunteers that may be working with children have they all been CRB checked? They say having responsible fishermen will help in the first week they have blocked paths, left rods un attended fished not on pegs so these are no better than the kids were are the bailiffs? Above can anyone seriously tell me this is safe the path its self is a death trap so lets make more dangerous by letting people fish there and block the path who did the risk assessment on this. We have requested details of the club, risk assessment, rules details of meetings and despite asking several time they have not been forthcoming what are they hiding? Pictures of the pegs on a two foot wide slippery muddy path show they haven’t done a risk assessment as its very dangerous to walk the path and having someone fishing makes it down right dangerous when pointed out to them they refused to comment. Some pegs are close to the bridge and this area is like a motorway for wildlife so the chances of killing wildlife is very high plus people feed them off the bridge and they could be caught as well. The Friends mins show the club was to start in January but they have rushed it through and fishing is now taking place why? Procedure and safe guards are needed if wildlife get hooked up this involves cutting the line and calling the RSPCA none of this is in place. The fishing club has been made a member of the friends no vote proposed or seconded the Friends mins state The group will be affiliated into the Friends Constitution – likewise the ANTs. So how can officers FORCE this on friends against the constitution are the friends group there as a political weapon controlled by officers? So what is the future for the friends if they cant speak for the public and effect decisions then they may as well disband. There are reports of alleged cyber bullying by a member of ANTS and the friends and this person has three complaints and allegedly forced one person of Facebook with the bullying, he has also told this person that the ANTs are moving the Burma island and Boar war memorials greatly upsetting this person and causing problems for many people. ANTS have been asked to take some action over this as its Anti Bullying Week and this sort of behaviour isn’t acceptable to anyone. I thank you for your email. The decision to support fishing in the park has been taken via the two public groups who so brilliantly support the park. It is the friends of the park and Ants who have recommended this and it is they who believe it is the right thing to do. I think you should petition these excellent people, who work tirelessly to improve the park and then the council will follow the majority view. The council is merely following the views of the majority of local people who represent the park. It is there suggestion not the council and I resent your attacking of your council without full knowledge. Please contact these groups to discuss and the council will follow the majority view. Fishing has always been a popular activity at Queens Park. It was temporarily stopped whilst the lake was reconstructed and then for a period to allow the fish stocks to recover after relocation back into the water. It was always the clear intention that angling would be restarted and this has been stated to the many people who have enquired over recent years. The intention to reintroduce angling has been raised at the meetings of the Friends Group simply as a means of gauging their opinion and keeping them informed. It is not the Friends Group’s role to formally make decisions on the management of the park but to give the community a voice in this process. We have excellent working relations with the Friends Group who play a large role in guiding our decision making. Angling does have its critics but it is also one of the most popular recreational activities in Britain today. At its best it is a tremendous way of building inter-generational cooperation as older anglers teach young people to fish. However, when uncontrolled it does lead to the problems as stated below. As managers of the park we have to make judgements about such issues. In this case it is our judgement that fishing will occur whether we sanction it or not as we do not have the resources to enforce a ban. By creating a new Queens Park Angling Club, attached to the Friends Group and run by some enthusiastic volunteers, we are trying to manage the activity and thus minimise any problems. It will bring more responsible adults into the park which will help protect the park in many ways. We have stated that we intend to review the situation again during the close season (Spring 2014). Wistaston Community Council's 'Christmas Concert' takes place on Friday 13th December 2013 (7pm) at St Mary's Church Hall, Church Lane, Wistaston. Tickets = £5 per person including seasonal refreshments. Tickets are available from St Mary's Church Office, Spar shop. All the profits from this event will be donated to children’s charities. South Cheshire George Formby Ukulele Society concert. They are so popular that people smash the windows when the practice so they can hear better. A monthly South Cheshire George Formby Ukulele Society - http://www.crewegeorgeformby.com - concert took place on Friday 22nd November 2013 in the Wistaston Memorial Hall, Church Lane, Wistaston CW2 8ER. The concert contained group, duet and solo ukulele performances and featured well-known George Formby songs such as 'Chinese Laundry Blues', 'When I'm Cleaning Windows' and ‘Leaning on a Lamp Post’, along with songs by other well-known artists. Performers came from Crewe, other parts of Cheshire and counties beyond. There were also two audience members on holiday from Adelaide in Australia, who were entertained with ‘Waltzing Matilda’ and ‘Tie Me Kangaroo Down, Sport’. Alan Newton was Master of Ceremonies and introduced each act with a quick fire repartee. Cathy Darlington was the Concert Producer. Hot and cold drinks and a wide range of refreshments were served during the interval. There were over 100 attendees. Society Founder Brian Edge said, "I encourage anyone to attend one of our Concerts or rehearsal sessions which take place throughout the year. You will be made to feel most welcome. Feel free to bring a friend along with you; you are sure to have a pleasant surprise." The next concert is the Christmas concert which takes place at 7:40pm on Friday 27th December 2013. Entry = £1. The Society was founded in 1994 and performs a concert at Wistaston Memorial Hall on the fourth Friday of every month throughout the year. There are no membership fees to pay to attend a concert and the entrance fee is just £1 to cover the cost of rent and refreshments. The 2014 concerts all start at 7:30pm prompt and take place on 24th January, 28th February, 28th March, 25th April, 23rd May, 27th June, 25th July, 22nd August, 26th September, 24th October, 28th November, (Saturday) 27th December. In 2014 the Society will be celebrating twenty years of monthly concerts in the Hall. There are also rehearsal sessions, to which new ukulele players are always welcome, at Wistaston Memorial Hall on the third Tuesday of every month throughout the year. The 2014 rehearsal sessions start at 7:30pm and take place on 21st January, 18th February, 18th March, 15th April, 20th May, 17th June, 15th July, 19th August, 16th September, 21st October, 18th November, 16th December. For further enquires please contact Brian Edge on 01270 569836. This week, we look at how the Council can assist vulnerable people with essential home repairs. Cheshire East Council is doing its bit to support older and disabled people with home repairs and adaptations to keep them safe, warm and independent in their homes. Care and repair is a service for older and disabled people, guiding them through the often complex or daunting process of carrying out repairs and adaptations in their own home. And the Council may be able to help people to find ways to pay for the required work through a loan or grant from the authority, including urgent heating repairs during the winter. Councillor Don Stockton, Cabinet member in charge of housing, planning, economic development and regeneration, said: “If you are over 60, or if someone in your household has a disability, Cheshire East Council can help. “People may need advice about home repairs or adapting their home to suit their needs or there may be small jobs around the home that they can no longer do. “Also, we may be able to help homeowners who need urgent help with heating repairs but can't afford it. We have access to some fast-track funds to help to quickly put the problem right, and also have information about loans for bigger and longer term repairs. “We aim to keep the charges as low as possible to make the service affordable and all advice and information is free of charge. · Helping to find ways to pay for home repairs and adaptations and checking entitlement to benefits. Sean Reynolds, the chair of the Adult Safeguarding Board, said: “Most of us want to live in our own homes and maintain our independence for as long as possible. “I welcome initiatives like these, which are intended to assist its most vulnerable people, especially during the winter months, to feel warm, healthy and safe. As of sunday 17th november the restriction on fishing was lifted and angling on queens park will be governed by the new QUEENS PARK ANGLING CLUB.Annual fishing permits are £5.00 and day tickets are £3.00. 16's and under are free to fish.Children 12 and under must be accompanied by an adult.All permits can be purchased from Crewe match angling centre on West Street and must be completed in full at point of purchase after reading and agreeing to the code of conduct. To promote the restoration (i,) capturing Queens Park’s Victorian splendour, conservation and enhancement of Queens Park in Crewe, for the benefit of residents, visitors, wildlife and fish. We believe that this is not met if fishing goes ahead as the majority don’t want it and its clear its not in the interest of Wildlife. represent the views of the residents of Crewe and other regions of the Cheshire East Council, in matters concerning the Park, This isn’t being met as the fishing wasn’t agreed by the committee and residents view were not sought on this matter. Its interesting that Cllr M Grant stated today she is having nothing to do with fishing, I hope she will then resign as a cllr as she is paid to put residents views forward the fact she comes in the park with her own dog never on a lead setting a fine example to others has been raised before. The ‘Core/Officers’ Committee shall consist of a Chairperson, Secretary, Fund Raising Officer, Treasurer and Parks Manager and any other such Officers as the Friends of the Park group may from time to time decide. Another big one as mins from the last meeting show that ANTS and Fishing are now part of this but FRIENDS were not given an option to vote on this so that is dictatorship not democracy. As the constitution hasn’t been followed in creating the fishing club it must be considered as null and void. Angling Club is to be established by January 2014. The group will be affiliated into the Friends Constitution – likewise the ANTs. Activities’ will include Youth sessions and initiatives to care and improve the waters and wildlife/fowl. Above who thinks this is safe the fishing pegs are in an area less than 2 ft wide that is passable so how can anyone safely walk around the lake? There has been no progress on the fishing and the council and other officials are refusing to say who agreed to the fishing club so we have put in a Freedom of Information request which by law they must answer. Things have got worse as the pegs have now gone in and its clear that they must be brain dead to put them were they have in the picture you can see they are on the muddy path less than 2 feet wide at the bottom of the lake. So once they fish there it will be impassable and dangerous to anyone who try’s. They have put some near the bridge and this is the main swim for all wildlife and therefore not safe for wildlife fortunately the Environmental Agency can take action on this as the park has had wildlife hooked before its considered a blackspot area and they can come in at anyone request and check the pegs don’t cover any swims and if they do they can remove the pegs. This can be changed at any time as new wildlife come in the park or start a nest. The park and club must carry out a risk assessment and they demonstrate by the placement of the pegs that this isn’t the case as its clear its dangerous. RISK OF INFECTION (e.g. weils disease, cross contamination from having touched bait, fish, discarded unused bait, water born algae). So there must be provision to wash hands. RISK OF INJURY: e.g. stings and bites from insects attracted to water and bait. Stings from plants etc. Poisonous plants. Therefore a registered first aider should be on site when anyone is fishing. Life Belts are not present in the park so they should be provided in case of anyone falling in the lake. We believe that’s swans and wildlife will die at the Queens Park as a new fishing club has been started from January. In the period of a month a Swan, a baby swan and a duck have suffered horrendous injures from being hooked by illegal fishing. The swan couldn’t raise its head or eat for days until the RSPCA rescued it. There has been problems with illegal fishing for a long time with them causing criminal damage, fishing without a rod licence skipping school to fish and riding through the park with 15 ft rods on bikes with line and hooks swinging about. There has on average only been 5-10 daily doing this but the fishing club are to have 27 pegs its not clear how many rods per peg but a lot allow 3 rods that equates to 90 lines in the lake. Simple maths tells us if you have a lot of swans ducks etc and 90 lines some are going to be hooked up. There are special problems on the lake, we have Grebes and other wildlife that swim under water for great distances and would be unseen by fishermen until its to late and as they are protected birds a fine of several thousand pounds could happen. The other problem is as soon as you go near the lake all the swans and duck come thinking you have bread for them. What has caused problems and letter of complaints in the press is how this has been done in secret. I am on the friends committee and we new discussions were taking place with fishing groups and we would then expect to here proposals on fishing for us to discuss and raise any objections to. We would also expect the public to be able to have a say in this as 98% of people visiting the park come to see or feed the ducks many come daily and know each duck by name. These people have come to the park for many years on a daily basis in winter and summer to care for the ducks. What has happened is that secret meeting have taken place as I and at least two other members of the committee were not told about these meeting or given the opportunity to go along we don’t know who attended these meeting or when they took place. The first we knew was kids at the skate park told us committee members that it had been agreed and would start in January. So who ever went to these meeting and they are refusing to name these people have made a decision for everyone that visits the park without the friends or member of the public been given the opportunity to object. It was discussed at the last friends meeting but not as an option to vote on but as a DONE DEAL it had been passed by these mysterious people. Apart from anything else democracy says that users of the park should be consulted and given an opportunity to put their case forward but it seems we have a dictatorship in the park. This week its fishing what will be passed behind closed doors next week? I have witnessed motorbikes being ridden across the lake bridge, and dog owners encouraging their dogs to attack waterfowl. And now it would seem that because the Council have been unable or unwilling to stop the unauthorised fishing in the park, there is a proposal to allow a fishing club to organise/regulate fishing in the park commencing in January. a) Health and Safety issues: Line casting near/on public footpaths. Absolute no brainer this one surely. b) Paths, (Public Access): This should be pretty obvious too. For example, the public will be expected to walk through mud, or wade through the gigantic puddle at the aforementioned west end of the lake to circumnavigate those fishing on the lake edge until the paths (missing or inaccessible since 2007! ), are installed in the Spring. c) Wildlife: To me, this is the most important. Numerous families bring their children to the park to see or feed the Swans, Ducks or Geese. There WILL BE continued incidents of waterfowl injuries due to this activity. In the last few months alone, the RSPCA have had to come to the rescue of the Signets and a Duck several times, due to fishing line or pellet. This surely is unacceptable. The lake is their home, and priority should be given to the majority of people who come to the park to enjoy the wildlife. d) Everyone I have spoken to is of the opinion that the vast majority of people would be against allowing fishing in the Park. Therefore, if this permission goes ahead, against the wishes of most people, serious questions would have to be answered. It is true that fishing was once permitted in the park many years ago, but that does not make it right, after all, cigarettes were once freely advertised on TV. I urge the Council to have a rethink, or to conduct a proper and fair survey, listening to the views of people who visit the park. Negative publicity and public petitions against this proposal will surely follow if these people’s views are ignored. He raise some good points mainly on safety as one old lady has been hooked up with fishing hook if they are using 15 ft polls and a lot do an area of 15ft all around the fisherman can be a danger area as they cast and as often this area will encroach on public paths there is a danger of children or dogs etc can be hooked up with careless casting. The clubs say they will have bailiffs but no one is going to come and sit there every day for 12 hours so that just isn’t going to work. I have asked for the location of the pegs but so far that has not been forthcoming but from what we can see it will all be at the bottom of the lake and to get that many in it will block some of the footpaths or put people in danger. This has now raised other questions about the park as Cllr Jones was informed incorrectly that the friends and ANTS had all recommended the fishing but this isn’t he case no vote was taken its your having it like it or not. Members of the ANTS confirmed today they didn’t know about the meeting with fishing clubs and no idea who went or any detail like were pegs will be, they certainly have not recommended it. Part of the problem seems to be that no one could be bothered to stop illegal fishing so to pass the buck to a club means they wont have to do anything and can blame the club if anything goes wrong this could be a legal issue as well that the club may be liable for any injury. The Dog wardens and community wardens have office in the park but refuse to patrol it as they claims its not down to them and when dogs attack the refuse to act see here. Again they have made very little effort to stop the fishing and on one occasion a council officer was shown people illegally fishing and told me to go an sort it out and refused to do anything himself. Problems with the park have all been blamed on CEC but now evidence suggest they may not be the main problem. After representation to Cllr Jones and he studied some other complaints he has taken action. It was pointed out to him that for instance a tree was cut down and the stump ground down and the rubbish left in a pile by the lake in August then the ANTS cleaned the boat house and added their rubbish to it that was over a month ago. The rubbish then with the wind and rain spread all over the path making it a safety issue so the total time it had been there is over 3 months. Its not a big job or costing thousands to remove. Dangerous trees were reported in Tipkinder woodland well before October and reported here http://www.queensparkcrewe.com/2013/10/queenspark-wildlife-group-action-plan.html. Nothing was done about those even though they were a danger. Another dangerous tree over 30 ft tall in the park next to the road was reported and no action taken until I personally told the tree men in the town and they came and inspected it and took it down off their own bat as its was so dangerous. On both occasions this was recorded on Facebook and acknowledged but no action was taken, mysteriously all these comments have now disappeared from Facebook so evidence has been destroyed WHY? Above one of over 10 ten dangerous trees felled after Cllr Jones stepped in. Cllr Jones once he knew took immediate action and with 12 hours the rubbish was removed and the trees have now been felled. But here is another one for him recorded before anyone can hide it. The rubbish from the tree stumps there is another pile that has been by the café from august but more importantly in August it was reported that there was a hole in the path by the lake. Surprise surprise its still there as you can see in the photo taken today it is very deep and I was nearly up to my knee in the hole. When I poked a 2 ft stick in it disappeared into mud and the path if you are heavy and walk on it collapses. I am no expert but it seems there is a very good chance that the sewer or drain under the path could make the path total collapse in to the drain along with anyone who stood on it. Again this is a serious safety issue the whole as it is could easily break someone’s leg or worse. Willaston and Rope Ward UKIP Councillor Brian Silvester is asking for reassurances that service levels will not decline if the proposed move of Crewe's main post office to W H Smith goes ahead. He said," I am pleased that there are to be no redundancies, it is proposed to move to a site in the town centre and the opening times will remain the same. (See attached and below) There will be six serving positions and all the current products and services ( except the external cash machine) will be retained. The Post Office must ensure that sufficient space is allocated to serve customers without congestion and that queues do not build up at peak times. There will now be a six week consultation period." Cheshire East bends to pressure over green waste collection. Willaston and Rope Ward UKIP Councillor is claiming a partial victory in his opposition to the close down of the green waste collection in Cheshire East (CE) See e-mails below. He said," CE have announced that for the next two collections residents can put green waste in the black bins which is not normally allowed.This shows that CE have badly mistimed the close down period and have had to allow further green waste collections.If CE had consulted properly before making their hasty decision all this uncertainty and disruption to the service could have been avoided. I hope CE learn the lesson from this and consults properly and in good time in the future." St Luke’s (Cheshire) Hospice is appealing for energetic supporters to help create a tide of red and white across Cheshire’s Oulton Park Racing Circuit on Sunday, 8 December, during its action-packed and family fun-filled Santa’s Day Out event. Organisers are hoping to make this year’s fun-filled event the biggest and best yet by inviting local people and business teams to sign up, don their Santa suits and run, walk, bike, rollerblade or even scoot around the iconic racing track, all in aid of the hospice. And there’s even more fun to enjoy at this year’s action-packed event, including a sure to be very competitive, Santa Hospital Bed Push which will see teams of four Santas pushing another Santa on a bed across a 500 metres track, and the hospice is looking for teams to sign up now. And that’s not all –once the racing is over, there will be a unique Santa Vs Mince Pie eating competition where fundraising entrants will work their way through a massive platter of mince pies all in aid of St Luke’s. The daring entrant that can eat the most in 10 minutes will be declared the winner and should certainly be fun to watch. Again brave entrants are needed so if you love mince pies, this is the challenge for you. To top it off, there will be a full Christmas market packed with food stands and gifts including an array of premium grade non dropping trees, beautiful hand crafted fresh wreaths, holly and ivy bunches and fresh English Mistletoe from 11noon-3pm, with the dash starting at 12 noon. St Luke’s iconic double-decker London Routemaster, Luke the Bus, has once again been transformed into Santa’s grotto so that youngsters can meet the real thing throughout the day. The hospice’s head of event management Jane Thompson said: “We can’t wait to see the whole of Oulton Park brimming with the famous red and white outfit. Whether it’s running, skating, bed racing and eating mince pies as quick as possible, we need supporters, families and corporate teams to make this the best event yet. “This year’s race will have even more categories than ever. Along with Dashing Santas, Strolling Santas, Biking Santas and Rollerblading Santas we will be having Scooting Santas. All adult Santas get a full Santa suit and youngsters will get a set of fun Christmas headwear. Entry to the event is £12 for adults and £5 for Children. Jane added: “In an attempt to increase our numbers we are not insisting on sponsorship as part of the package for the run. You can choose to take part just for fun. “However if the hospice is close to your heart and you can fundraise, we have lots of ways you can do so and we do hope our fantastic supporters will take part in aid of the hospice’s invaluable work. Contact Jane Thompson at St Luke’s (Cheshire) Hospice on 01606 555688 or jane_thompson@stlukes-hospice.co.uk for more information or to register your interest. On the 1st January 2014 Romanian and Bulgarian citizens will be totally free to enter the UK. Earlier this year Migration Watch, a think tank which has a good record of forecasting migration, published figures, suggested that 50,000 Romanians and Bulgarians a year will come here.This would equate to around 2000 coming to Cheshire East in the next seven years. There are already several thousand East Europeans, mainly Polish, in our major towns like Crewe, Congleton and Macclesfield. Parts of towns like Crewe have been transformed since 2004 and the local population, who have lived there all their lives, feel rightly aggrieved. Nobody asked them if they wanted this major change on their doorstep. This can only get worse with an open door to thousands of Romanians and Bulgarians. In Kent it has been estimated that the additional pressures placed on local authorities, schools, social service, the NHS and doctor services could cost the Council an additional £3million a year. Even now in Cheshire East many local schools are oversubscribed, it is difficult to get to see a doctor and thousands are unemployed. Allowing the free entry of thousands of migrants, from mainly impoverished Eastern European countries can only make these problems worse. Some senior politicians are stating that this latest influx of migrants could even lead to civil unrest in some of our towns. I am calling on all the Cheshire East MPs to urge the Prime Minister, even at this late stage, to consider enacting the emergency provisions buried deep in European Union (EU) treaties to prevent giving an open door to Romanians and Bulgarians from the 1st of January 2014. In the longer term the only way to get control again of our borders and immigration is to leave the EU.The only party who are committed to do that is UKIP. Local people should vote UKIP at every opportunity to get the control of their country and its borders back again. This week, we outline what our highways service is doing to keep the roads safe before the cold weather really hits. Cheshire East highways team says it is fully equipped to cope as the winter weather begins to take hold. As part of the Council and partners’ Winter Wellbeing campaign, the authority, armed with stockpiles of salt, an online information centre and modern gritting vehicles, is reminding residents of its preparations and current actions. Councillor David Topping, Cabinet member in charge of the environment, said: “Winter weather can be a worrying time for many people, especially those who need to travel. We aim to be as informative as possible in the event of severe weather conditions. Duty officers receive detailed weather reports, around the clock, during the winter months. These officers then decide if gritting vehicles or snow ploughs are required. Councillor Topping added: “The monitoring of weather conditions here in Cheshire East never stops during the winter months. Gritting vehicles or snow ploughs can be dispatched in minutes in the event of conditions deteriorating quickly. “Freezing temperatures usually result in gritting taking place twice a day – once in the early hours of the morning and again in the evening – but this can be increased or decreased according the conditions that day. Crews have been sent out regularly over the past few weeks to salt the roads, particularly on higher ground. Councillor Janet Clowes, Cabinet member in charge of health and adult social care, said: “Frozen roads, as well as the extra hours of darkness, bring obvious additional risks, such as falls and involvement in road traffic accidents. “For older people, a relatively gentle fall can result in a serious fracture. For Cheshire East’s most vulnerable citizens, winter can also mean increased loneliness and isolation. Fifth annual BOXjam breaks records! That's how organisers described the annual charity BOXjam event which took place on Sunday (November 17) in Crewe. More than 200 people watched over 25 bands at The Box and Bar 7 as record funds were raised for the event’s two charities. A total of £664.74 will be split between Crewe’s Oxfam store on Victoria Street and The Christie cancer hospital in Manchester. This ensures the total amount raised surpasses the £2,500 mark over five years. Organiser Simon Newbury, of Simon J Newbury Photography, said: “That was easily the best BOXjam I’ve ever had the pleasure to organise. “Not only was it so well attended and received, the breadth of style and standard of the artists was much bigger this time too. Highlights were many but Son of Shinobi impressed on the main stage as did Oli Ng's solo set in Bar 7. And everybody gathered at the main stage to see South Cheshire's newest act Moving Moscow perform a ‘taster’ set of four songs. They certainly left onlookers wanting more and fully justified the social media hype they had generated in the week prior. Further to the bands, money was raised through cake stalls, art posters and the BOXjam raffle. A silent auction also added to the variety. The Box itself is celebrating five years of live music and this was marked with a thousand-strong digitally-projected exhibition of photos of bands and musicians taken by organisers Simon and Tina Newbury. Tina even took to the stage with Helen Sladen to perform a set of covers in Bar 7. BOXjam also welcomed its first resident poet, Paul Ellson who added variety with his unique take on politics and also BOXjam itself. The annual Cancer Research UK ‘Christmas Fair’ took place at the Wistaston Memorial Hall on Saturday 16th November 2013. The event was organised by the Crewe and Nantwich Support Group for Cancer Research UK http://crewenantwich.cancerresearchuklocal.org/ . There were numerous stalls selling gifts, plants, cakes and Christmas cards, plus a Tea Room serving drinks and snacks. There was also a Teddy Bear Tombola and of course Father Christmas was there as well. Committee chairman John Pass said, “This year we have had a record crowd and we thank everyone for their support. Once again the people of Wistaston have rolled out in numbers to support Cancer Research UK. We hope to exceed last year’s total of over £3,000. The text below appeared on the FE week website - http://feweek.co.uk/ - on Thursday 14th November 2013. A former principal and ex-president of the Association of Colleges has been appointed as the government’s first FE Commissioner. Dr David Collins CBE, also a former interim chief executive of the Learning and Skills Improvement Service, will take the new troubleshooter post which comes with the power to call for the closure of failing colleges. He was principal of South Cheshire College Group for 16 years from 1993, before serving the same post in an interim capacity at Guildford College Group for 2011/12. Dr Collins said: “I would hope to bring my extensive experience in the sector to bear in this new post so that problems in colleges and other institutions are swiftly addressed for the benefit of learners, employers and the local community. “I have worked closely with governors and staff in the past in colleges and institutions that have received a variety of Ofsted grades and have always found a positive response to quality improvement. The FE Commissioner will be sent in if a college is graded inadequate by Ofsted, is in financial trouble or is failing to hit learner success targets. He will report directly to Ministers with the aim of turning the college around within a year. He could call for institutions to be slapped with ‘Administered College’ status, thereby losing powers over staff changes, expenditure or transfer of assets. Dr Collins could also recommend governors be kicked out, but ultimately he could also call for a college to be dissolved. Skills Minister Matthew Hancock said: “David’s 35 years of experience, including leading an outstanding college, mean that he fully understands the sector and the levels of excellence that can be achieved. The role of the FE Commissioner — a two-year fixed term contract — is set out in Rigour and Responsiveness in Skills (April 2013). The commissioner call on the support of a team of advisers, who have already been appointed. Dr Collins’ team of advisers includes Marilyn Hawkins, chair of the 157 Group for 2011/12, and Malcolm Cooper, managing director and owner of MCA Cooper associates, which advises FE providers on finance and general management issues. Lynn Forrester, director of Quality4fe, which is part of the FE Solutions confederation, and David Williams, director at education management consultancy W3 Advisory Limited complete the team of FE Commissioner advisers along with Joanna Gaukroger, director of J2J Partnership Limited and former principal of Tower Hamlets College and Kensington and Chelsea College. Willaston and Rope Ward Councillor Brian Silvester called in the Local Government Ombudsman over the curtailment of the green waste bin collection for 4 months in Cheshire East. He said," I am surprised that the Ombudsman will not investigate my complaint because I am a Councillor. (See attached and below).It seems wrong that a Councillor is unable to make a complaint as a resident, like anybody else. In these cases, Councillors are being treated as second class citizens. However, all is not lost. I have had many communications from across the whole of Cheshire East. There is lot of anger about the way this decision has been taken and the timing of it. Several residents have volunteered to make their own complaint to the Ombudsman and I am sure that this will happen quickly." A charity fundraising concert featuring The Co-operative Junior & Beginner Wind Bands and pupils of Willaston CP School takes place this Friday 15th November at 7pm at Brine Leas School in Nantwich. Tickets: Adults £3, children £1. Proceeds to Alder Hey Children’s Hospital. A week ago, a sinister image of six people appearing to be held hostage was released. Now, following a week-long campaign across social networking, the mystery guests at this Sunday’s BOXjam event in Crewe have been revealed. More than 25 bands and artists will be performing across two stages at the annual charity fundraiser at The Box, Pedley Street. And joining the likes of headliner George Borowski, Son of Shinobi and Hex is South Cheshire’s new alternative six-piece – likely to raise a few eyebrows among those interested in the local scene. Moving Moscow is all about second chances – uniting former members of Sgt Wolfbanger, Sumo Kings and The Retrospective. “I’ve been waiting for over three years to do this,” explained frontman Dan Parry, who is joined by Jamie Oliver (drums), Jazz Sladen (keys/strings), Si Halewood (bass/vocals), Dean Banks (rhythm guitar) and Steve Foster (lead guitar/vocals). “It was just waiting to find the right musicians. “The name came from an article I’d read about Moscow – being a city with a lot of potential and despite the investment, couldn’t become the next New York, Paris or London. “Individually we’ve been lucky enough to play in some decent bands and for one reason or another, things didn’t work out. When The Box first opened five-and-half years ago, Wolfbanger were arguably alongside Rig Up Explosive (now Blitz Kids) as the pick of bands to push on. The Sumos were a band that did things their own way, supporting many of the big names (Feeder/The Bluetones) to arrive either at the venue or the old M Club. “It doesn’t sound like anything any of us have done before,” he continued. “We’ve all been keen to get the standard as high as possible from the off. “I’m really excited about performing these songs, it’s a lot more ballsy than what I used to do and I think the heavier sound suits us all. Parry says BOXjam is the perfect opportunity to kick things off. “We’ve been all so busy writing, we weren’t sure when to test run the tracks to introduce ourselves back into the scene,” added Parry. “To go in mid way through the event is perfect for us and the fact that it’s such a good event supporting those charities is a real bonus. Police are appealing for witnesses following a fatal collision near Nantwich. At 1.40pm today (Tuesday 12 November) police received reports of a collision between a lorry and a cyclist on the A530 Whitchurch Road in Aston. At the time of the collision the lorry and the cyclist were travelling from Nantwich in the direction of Whitchurch near to Baddeley Bridge. Sadly, the cyclist has died at the scene. The lorry did not stop at the scene and is believed to have left in the direction of Whitchurch. The lorry is believed to be light coloured with blue or green markings on the side. Emergency services are currently at the scene and road closures are in place − drivers are advised to avoid the area if possible. Anyone who witnessed what happened or has any information, which might assist officers with their enquiries, is urged to call Cheshire Police on 101 quoting incident number 453 of 12 November. Information can also be passed on anonymously, via Crimestoppers, on 0800 555 111. The Remembrance Sunday parade and service in Crewe took place on the morning of Sunday 10th November 2013. There was a parade through the town followed by the Remembrance service at the Britannia Memorial on Municipal Square. The Parade Marshall was Lt RL Jones RNR, the service was led by the Mayor’s Chaplin Revd Hazel Rugman, with a Bible reading from Mayor of Cheshire East Councillor Dorothy Flude. There was a two minute silence. Several local organisations, groups and schools were present and laid wreaths during the ceremony. The music was played by Crewe Brass. This week, we discuss how people can be good ‘winter neighbours’. Cheshire East Council and its partners are urging residents to be a good ‘winter neighbour’ this season. As part of the Winter Wellbeing campaign, the Council would like people to check in on their friends and neighbours, especially if they are older or if they have heart or breathing problems, as they may need your help and our support. The winter cold can be distressing to some and a phone call or a knock at the door can make all the difference and can brighten their day. And with temperatures now dropping, it is worth considering if someone’s home is warm enough. Living rooms should be heated to 21C and bedrooms to 18C. Information about heating repairs can be found at www.cheshireeast.gov.uk/homerepairs or by ringing 0300 123 5017. Also, note if your neighbour has enough food and medicines to prevent them having to go out in very cold or icy weather. · Bins not put out on collection days. Councillor Janet Clowes, Winter Wellbeing spokeswoman, said: “As temperatures fall, there will be many who are worried either about their own ability to cope, or about another adult, and maybe looking for social care support. Or there will be those who are looking for services to support families or children. For concerns about the welfare or safety of an adult, call 0300 123 5010 (8.30am-5pm) or 0300 123 5022 outside these hours. The family information service is available on 0300 123 5033. For concerns about the welfare or safety of a child, call 0300 123 5012 (8.30am-5pm) or 0300 123 5022 outside these hours. For domestic abuse assistance, call the Cheshire East domestic abuse family safety unit on 01606 363532 or the national 24-hour helpline on 0808 2000 247. Residents can help friends and neighbours who do not have internet access by downloading and printing off information from the website and giving it to them. Connecting Cheshire has revealed a fibre broadband rollout map just seven months after the signing of a £28.5m deal between BT and four Cheshire councils to bring fibre broadband to 96 per cent of Cheshire. The map shows where communities throughout the county can expect the high-speed technology to arrive by the end of summer 2015. Both residents and businesses can check the map by visiting www.connectingcheshire.org.uk/check-availability to find out more. The map shows the many areas already able to access fibre broadband through the private sector’s commercial roll-out, largely in urban areas, and those planned to be connected under the Connecting Cheshire programme, which will extend the network to over 80,000 premises in mainly outlying and rural communities, plus those areas still under evaluation. The Connecting Cheshire broadband programme will be delivered by Openreach – BT’s local network business – building on BT’s commercial investment in the county already committed as part of its £2.5 billion overall commercial investment in UK fibre broadband. A massive 875 miles of fibre-optic cable will be laid – more than the distance between Land’s End and John o’ Groats. This will be a significant engineering challenge, testing BT’s engineers to the full as they work to upgrade the county’s infrastructure, both underground and up telegraph poles, in all weather and often at night, to minimise traffic disruption. As a result of the programme, broadband speeds will increase significantly. Ninety six per cent of Cheshire premises will have access to speeds of up to 80Mbps, whereas Cheshire’s current average downstream speed is 16Mbps (Ofcom UK Broadband Speeds Report, June 2013). The final four per cent of premises are under evaluation and the project is seeking additional funding or technological solutions to upgrade them to high speed broadband as soon as practicable. In any event these areas will see faster speeds as the project aims to deliver 2Mbps or more to all homes and businesses by the end of 2016, via enhancements to the existing copper network. This will be a significant speed boost for the most remote homes and businesses as 12 per cent currently receive less than 2Mbps. BT’s network will be open to all internet service providers on an equal wholesale basis and so Cheshire households and businesses will benefit from a highly-competitive market, in turn bringing greater choice and lower prices. There are a range of factors which impact on the viability of the upgrades to fibre within the Connecting Cheshire programme. These include the number and density of premises, the deployment cost, the proximity to existing fibre infrastructure and whether eligible small or medium-sized businesses would be served, which is a condition of the project’s European funding. Connecting Cheshire expects to announce in early December which specific areas will be included in the first stage of its roll-out, with further phased announcements thereafter. Homes and businesses in at least 20 telephone exchange areas will see upgrades as part of the first phase and be able to contact their internet service provider to order a switch to fibre broadband from the end of March 2014 onwards. Councillor David Brown, Deputy Leader of Cheshire East Council, on behalf of the Connecting Cheshire Partnership, said: “Superfast broadband will open the doors to countless business and social benefits, everything from making it easier for businesses to connect with customers to helping children with their homework. To view the Connecting Cheshire broadband rollout and coverage map visit www.connectingcheshire.org.uk and click the Check Availability tab. Welcome to this, my 143rd news bulletin. One topic that a lot of constituents write to me about is the Government’s plan to cap the amount of benefits that a workless household can receive at £26,000. The vast majority are very supportive. I realise too that some people are concerned about the policy, but I believe that the cap has been set at the right level. The system we inherited from the last Government is not only unaffordable, but it has trapped some people in Crewe and Nantwich in poverty. Too many people were better off out of work and on benefits, than if they entered the world of work, and this created a culture of entitlement and welfare dependency. It’s simply not fair that benefit claimants can receive higher incomes than families who are in work. In some cases this is more than double the average household income, and in extreme circumstances, up to £104,000. That's why we've brought in a cap on benefits, so that no family can get more on benefits than the average family does by going out to work. Importantly the benefit cap will not affect the disabled or those who are in work and receive working tax credits. However, there has to be a limit on the amount of money benefit claimants can receive, and I believe that the current the limit is currently set at a fair rate of £26,000, which, it is worth noting, is the equivalent to someone earning £35,000 before tax. This is a salary that many working families would be happy to receive, and underlines the point that hard working people should not pay their taxes in order to support people who refuse to work. The good news is that our local economy has improved dramatically, and there are now fewer than 2,000 people claiming Jobseekers Allowance in Crewe and Nantwich - something we haven't seen since January 2009. This figure dropped a staggering 14.4% in the last year to October. Youth unemployment has also dropped 17.6% in the last year, and has outstripped the overall rate of unemployment reduction locally. So with unemployment in the constituency dropping almost a quarter since Labour left office, and a strong policy on welfare, I believe we are getting our local economy back on track for the success it deserves. You can forward this bulletin on to your friends and family, who can sign up themselves by clicking here for my website. Visited Gateway Peugeot in Crewe, where the staff are "Getting sudsey for Pudsey" and organising a car wash event this weekend, in support of Children in Need. The fundraisers there have already making great strides towards their target, having already raised more than £1,000 for this vital national charity. Addressed the Age UK Cheshire AGM at Richmond Village retirement home in Nantwich, where I was pleased to answer questions from local people about what the Government is doing to 'rural-proof' policies and to tackle the problems that older people face in more rural areas, compared with more major towns and cities. Presented awards and certificates to staff at the Crystal Legal Services Ltd Awards Ceremony at Crewe Hall, with the Deputy Mayor and Deputy Mayoress of Cheshire East. Hosted two of my regular advice surgeries, to speak face-to-face with local people about local and national issues. To book an appointment to speak to me about any concern, please get in touch using the contact details below. Attended Acton Amateur Operatic Society's brilliant production of 'Me & My Girl'. Met with representatives of Hough and Chorlton Parish Council, to discuss their response to the Government's consultation on the route of the planned High Speed 2 rail line. Attended a special Sunday service at West St Christian Fellowship, focusing on fostering and adoption. ...and this weekend I will be joining local people, civic representatives and members of the armed forces in both Crewe and Nantwich, as we come together on Remembrance Sunday. The latest edition of my Westminster Report has been delivered across Crewe and Nantwich. Click here or on the image to read a copy. I was pleased to launch this year's Children in Need fundraising drive at Gateway Peugeot in Crewe. Peugeot is nationally an official partner of the charity, and this year the company is running "the UK's largest car wash" to raise money. You can see all of my photos by visiting my website. The Crewe News: In the run-up to this year’s Trustees’ Week, Edward Timpson, MP for Crewe and Nantwich, is thanking local charity trustees for their dedicated work in running local charities, and highlighting the benefits of becoming a charity trustee. There are hundreds of charities in South Cheshire, covering a wide range of activities and services, but all depend on the trustees that oversee their work, most of whom are volunteers. Trustees’ Week raises awareness of the work they do, and also highlights how people can benefit themselves by becoming trustees, through gaining valuable experience and skills. Edward said: “We have some fantastic local charities doing really important work and their trustees are integral to this success. I am patron of several, including Leighton Hospital’s One in Eleven Appeal, Supported Community Business, and Home-Start Central Cheshire. "As we approach Trustees’ Week I want to pay tribute to the tireless work they undertake to help others and keep the charity sector in constituency so vibrant and strong. Trustees’ Week runs from 4-10 November 2013. To learn more about Trustees’ Week and trusteeship, visit www.trusteesweek.org.uk and follow @trusteesweek on Twitter. The website includes case studies, recruitment resources, details of local events being held during Trustees’ Week and links to trustee matching services for those who want to become a trustee. Do you have community news to share? Are you involved in any projects that could be of help or interest to local people in Crewe and Nantwich? E-mail me and your news could be here too! Nantwich News: Crewe & Nantwich MP Edward Timpson has backed the St Luke’s Hospice 25th anniversary campaign to raise vital funds. The Cheshire hospice has launched a “Regular Giving Campaign” to encourage more donors to come forward. Mr Timpson is calling on the hospice’s supporters to help secure long-term patient care. The campaign is inviting locals to donate as little as £2 a month through its new “Regular Giving” plan. He said: “Over the last 25 years, the hospice has been indebted to its wonderful and dedicated network of supporters. St Luke’s head of community fundraising Diane Eeley added: “Regular Giving enables us to sustain our future with more confidence and reach more local people and their families and friends. £2 a month enables the hospice to provide two meals for a patient during respite breaks at St Luke’s or visiting the day hospice. More than £6,500 a day is needed for St Luke’s Cheshire Hospice to open its doors. Most of that money is found through supporters and fundraisers. If you can help call St Luke’s (Cheshire) Hospice on 01606 555887, visit www.stlukes-hospice.co.uk/ways-to-support-us/regular-giving/ or e-mail regulargiving@stlukes-hospice.co.uk. Crewe Chronicle: Children's Minister Edward Timpson praised the ‘exceptional achievement’ of Wistaston Green Primary School, saying he was proud to have the school in the Crewe and Nantwich constituency. “An outstanding education is probably the best start in life we can give our children. For Wistaston Green Primary to deliver that so soon after being in special measures is truly exceptional and a testament to all the staff, governors, parents and pupils who have taken on the challenge with real relish and determination,” said the Crewe and Nantwich MP. This is an extract from a longer article celebrating Wistaston Green Primary's achievements. Read the full article at the Crewe Chronicle website. Cheshire East Council is urging people not to miss out on the chance to vote as the annual renewal of the Electoral Register gets under way. Households have now been sent renewal forms, which they need to send back to the Council by November 15. If people are not on the register they are not able to vote in elections. However, the Electoral Commission reckons that 44 per cent of those not on the Electoral Register mistakenly assume they are. Meanwhile, a previous study also showed a marked gap between sign-up rates across the generations, with only just over half of 19-24 year-olds registered to vote (56 per cent), compared with 94 per cent of those aged over 65. Leader of Cheshire East Council, Councillor Michael Jones, urged residents to return their forms. He said: “Voting is the basic civil right for anyone living in a democracy. But it’s important that with rights come responsibilities. “As we commemorate Remembrance Day it’s timely that we bear in mind our duty as citizens. A good way of doing that is to make sure as many people as possible are signed up to the electoral register. The next elections facing Cheshire East voters are the European Parliamentary elections on May 22, 2014.